American River College offers a wide variety of music performance ensembles, ranging from orchestra and symphonic band to groups like big band and vocal jazz. One of the less known groups on campus is the ARC Latin Jazz Ensemble, led by Professor of Music Dyne Eifertsen. The group is a class offered as a Music Performance course. No experience is required, only a willingness to learn, according to Eifertsen. Eifertsen started the Latin Jazz band at ARC around 12 years ago, in an effort to expose students to something different from more traditional music courses. Latin jazz is a much different style than more Western style music, with a greater emphasis on the percussion. 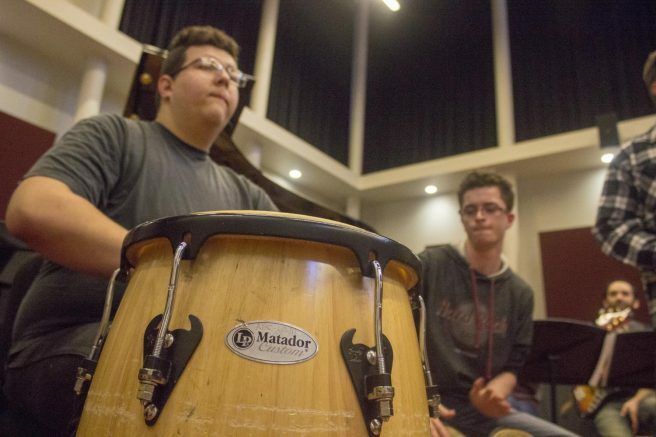 The setlist this semester will include works from the late Tito Puente, a famous New York-based Timbale player who wrote “Oye Como Va,” Wayne Wallace, and Grammy winner Poncho Sanchez. Tenor saxophone player Steven Sharp, who is on his second semester with the group, says he finds the music enjoyable to practice and perform. “Compared to studio jazz, [Latin jazz] gets the audience more engaged in the music, from what I notice when performing,” Sharp said. The first performance this semester for the group will be at the Woodcreek High School Jazz Festival on Feb. 24, in exhibition alongside with the Studio Jazz ensemble, followed by a concert at ARC’s Main Stage Theater on March 8. Postings for future concerts and events will be available on the ARC music website. 1 Comment on "Latin Jazz Ensemble prepares for concert"
HOW DO I GET AN AUDITION FOR THE Latin Jazz ensemble?